Gerber Off Road Survival Kit Pack. 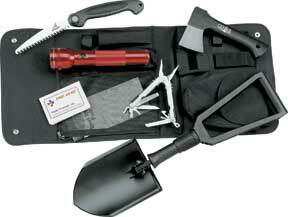 Includes one MP-600 model Multi-Plier, Back Paxe Axe, Folding Spade, Sports Saw, and a Maglite 2D cell flashlight. All stored in a compact easy stow 12"x11"x3" black nylon case.